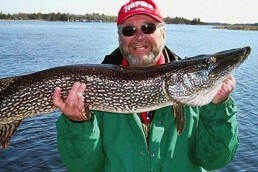 You recognize that hat-tipped-back smile of the accomplished fisherman, and you might know that he invented the Ugly Bug jig and the Bait Walker (first “bottom-bouncer”), and you probably know the story of his father, Don Gapen, and the Muddler Minnow. You might know some of his other fishing tackle inventions, and you might have read Wilderness North or others among his many books. Most of us only know Dan Gapen, Sr. and his story at a superficial level, but there are documentary clues hinting at his essential character. Even among recent fishing pictures, for example, you’d be hard pressed to find one where he’s seated in a boat that looks like what they sell on today’s polished showrooms. It’s not about the craft. It’s about the waters that float it, the fish that live in those waters, and the wildlife that live on the land surrounding those waters. 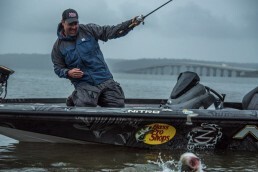 Though most of us know him through countless fish photos, that is but one aspect of who he is. The whole of his heart is bent on blending with wild places, tethered to the land he has lived on and known, including high above treeline where few humans tread. MidWest Outdoors: You were born in Duluth, and your first five years were spent at your grandparents’ resort on the Gunflint Trail, on Hungry Jack Lake… do you have any memories at all, maybe from the end of your time there? Dan Gapen: No, not really, but I do remember my grandfather planting smallmouth bass off the dock at Hungry Jack lake. I was about five at the time, and I’m 83 now. I’m the old-timer that I used to talk about. My grandfather planted those first smallmouth on the Gunflint Trail. And from there, they migrated all through that border country. At that time, it was mainly splake (a cross between brook trout and lake trout), lake trout, northern pike, perch and walleyes. MWO: So that region was not a smallmouth destination until years after your grandfather put those first smallmouths into Hungry Jack. Gapen: That’s right, they were the first smallmouth ever planted there, and I don’t know how he convinced the DNR at that time to do it. But he did, and everybody was saying at the time, “they’re going to ruin the fishery for the trout.” They never did, but nowadays you can fish smallmouth bass from Hungry Jack all the way to Basswood Lake, and it’s all thanks to my grandfather. MWO: And now tourism, in many ways, is built around the smallmouth bass in that country. MWO: At five years old, you moved with your parents to a wilderness resort near Nipigon, Ontario. Your parents were running the resort and you grew up learning to live off the land, something that people talk about but few ever actually do. So we might get a glimpse of what life was like for you at that time, in that place, describe a typical day. Gapen: We had nothing but outdoor privies, for one thing. Indoor water had to be carried from the lake, and that was my job starting when I was about eight. The water had to be carried about a quarter of a mile, and we needed it for our drinking water, for cleaning, for bathing. We hauled it in big pails, that held about four gallons, I suppose. One night was our bath night, Saturday night. We had a big galvanized tub, and we put it in front of the airtight stove. All our heating was with wood. My sister, Vaughn, would get to take a bath first, and then I’d get to take one. The bath water came from as many pails as I wanted to carry, and in the winter from big icicles that hung down off the roof in the winter. I’d have to break off the icicles and Mom would put them in the tub on the stove and melt that ice. As time went on, it was my job to chop and cut all the wood. We had an old Model T with a big band, a felt band, that ran a saw, a big round blade, off the back wheel of the car. We would cut the logs in the summertime, then I would split them. Every day when I got home from school in the winter, I’d have to carry wood for the stove. My mother insisted that she have tamarack for her cooking stove. Tamarack burns real hot, and it’s a fast-burning wood. So I would have to go cut tamarack logs into about eight pieces for the cookstove. I remember that well, even though I was only eight, nine years old. My first memories after we moved to Nipigon, to a place called Chalet Bungalow Lodge—it’s still there; Bobber Anne and I were back there last year, filming. It’s all still there, including the old fly shop where we made the original flies. My dad started me tying flies when I was six years old. When I was eight, I was tying flies for half a cent apiece. That was big money at that time. You know, I tell my grandchildren that and they say, “that’s crazy, Grandpa, nobody works for half a cent apiece,” but I tell them I was happy to get it. MWO: You have a special story about the first time you caught a trophy brook trout. Gapen: My dad took me on the Nipigon River, two years after he invented the Muddler fly at Virgin Falls. We ran the whole river down to Pine Portage. At that time, it hadn’t been inundated by water. I caught my first big brook trout, all by myself, a 6-pound brook trout on a fly rod, a little bamboo fly rod that I had. I remember coming down that river, in a canvas-covered canoe, a native in either end of the canoe. And I did. I caught that fish, and it’s a vivid memory in my mind. I can remember every detail of it. I remember jumping out of the canoe and going up to my dad and telling him about the fish, and he was very proud of me. MWO: You were in daily contact with members of the Ojibwe band, and they were a big influence on you. What are the most important things the Natives taught you, that helped form Dan Gapen into the person he became as an adult? Gapen: I learned more from the old Natives than anyone. There was a fellow I remember from back when I started guiding, when I was 14. My dad put me under his watch; his name was Michel Dava, and he was 67 at the time. He used to pack for Hudson’s Bay Company. He was unusual for a Native, because he was 6-foot-2 and could pack 400 pounds of weight on his back, and that’s how they got paid, a half a cent a pound. Dad put me under his care, and I guided with him. I could tell story after story about that old Native and what he taught me. I learned so much from a lot of the Natives that I grew up with. The reserve was right next to our resort, and I went to school with the Native boys, and I’d come home and cut wood and by the time I got everything done it would be dark and I’d go to sleep and get ready to do it again. MWO: Conservation, and keeping wild places wild, is an important part of your life. Did you pick that up from your life with the Native people, was it mainly from just being in those wild places, or where did that come from? Gapen: My love for the land and the wilderness I grew up in has never quit. And as I now live on 40 acres here in Sherburne County (Minnesota), I’m surrounded by the metro area, but in here there is so much wildlife and I just love it. But yes, the Natives had a big influence on me and my upbringing and how I want to save and preserve the wildlife we live with. MWO: Think out loud, tell us one story about old Michel Dava that you guided with, maybe one thing you did with him that encapsulates your relationship. Gapen: Oh, there were hundreds of things. But I remember him teaching me about handling a boat. On the water with waves, every sixth wave is large, every seventh wave is huge, then it goes back down again. So when you’re running across the lake in a canoe, you have a wave pattern that you’ve got to be aware of. That was just one thing I learned from him, of hundreds of things. That old man was probably the biggest influence in my life. That man loved the land, he lived off it like we did. Every fall, I had to shoot at least one moose. My dad would send me out and say he wanted a dry cow under two years of age, or a yearling bull. One time when I brought the meat in, one of the legs, and the hind quarters were almost 200 pounds. Michel Dava looked at it and started shaking his head ‘no’ and said, “big moose, no like, father mad.” I tried to pass it off as a small moose, but he said, “no, no, big moose.” He was right, of course, but I was trying to hide that fact from my father. We would take our moose meat, leave the skin on, hang it in an ice house. We cut our ice in the winter out of the lake, put it up in the ice house, and covered the ice with sawdust from where the wood was cut. Anyway, Dad took one look at the leg of this moose and told me to bring the horns in. I tried to tell him they were small horns and not worth seeing, but he made me bring them in. They were 67 inches, the third-largest moose shot in Ontario at that time. Big set of horns. They’re still in the lodge up there. My dad said, “well, Son, we’re going to eat a lot of hamburger this winter.” That’s all I remember him saying after he saw the horns. But old Michel, he was such an influence. We would go guiding together. I was 14 years old and he was 67. He never talked very much to the tourists; all he would say was “no” or “yes” or “maybe,” to the questions they would ask him. But when it came time to make shore lunch, he’d beg a cigarette from somebody, take the cigarette and punch it into an old corncob pipe he had, start smoking, and start telling a tale. Meanwhile, I was filleting the fish, cooking the shore lunch, and about the time I got done, the story would end. I complained to my dad, and he said, “tourists don’t want to hear from young kids, they want to hear stories from an old Indian. You just go ahead and keep doing the cooking.” So that was settled. But that old Indian, I just loved him. Born: April 9, 1932, in Duluth, Minnesota. Spent his first years at his grandparents’ resort on Hungry Jack Lake on the Gunflint Trail. First big move is to Nipigon, Ontario, where they run a resort, Chalet Bungalow Lodge. 1936: Dan’s father, Don Gapen, begins what became The Gapen Company, with the Muddler fly. The company continues today, under the direction of Dan, out of its headquarters near Becker, Minnesota. 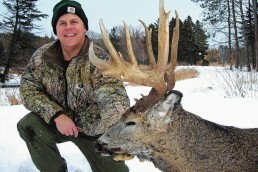 There’s much more to our conversation with Dan Gapen, and you’ll find it in the Podcast section of MidWestOutdoors.com. Click here to listen right now! At more than one point, if you listen carefully, you’ll hear him tear up. Find out what moves this man of the land… and while you’re at it, we hope you have time to listen to some of our other featured interviews as well. We’ll see you there… it’s time well spent.